In the even that you've missed them in the past, allow me to bring up two points that I mention quite often in my reviews. First of all, I'm a lifelong horror movie fan (although, I don't consider myself to be a "fanboy", but that's another conversation). From my earliest memories, I've been drawn to scary movies and I watch every one that I can. Secondly, I really don't like movies made before the early 1970s. These movies often feature very wooden acting, annoying musical scores, and slack pacing. These two views clash when it comes to older horror movies which are considered to be "classics". 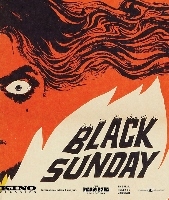 For decades, I've read about Mario Bava's Black Sunday, but I'd never seen it. When an opportunity to review it came along, I decided that I would finally see what all of the fuss was about. Black Sunday opens in the 17th century, where Princess Asa Vadja (Barbara Steele) and her assistant Javuto (Arturo Dominici) are put to death to cavorting with Satan and being what the locals call "vampires" Before they are burned, masks are nailed to their faces. As she is dying, Asa places a curse on her ancestors. The story then leaps ahead two centuries. Dr. Thomas Kruvajan (Andrea Checchi) and Dr. Andre Gorobec (John Richardson) are traveling through the countryside to a convention when they coach breaks down. They get out to investigate and find Asa's tomb. Dr. Kruvajan accidentally damages the cross protecting the crypt and Asa awakens. Meanwhile, at a nearby castle, Prince Vadja (Ivo Garrani), Asa's descendent, falls ill, and he's overseen by his children, Constantine (Enrico Olivieri) and Katia (Barbara Steele), who is a dead-ringer for Asa. As Asa's power grows, Javuto rises from his grave and soon several more "vampires" are created. Katia and Dr. Gorobec must team up in order to stop the evil. When watching an old movie, one must remember that they are watching at old movie. What I mean by that is that I can't judge the 55-year old Black Sunday by today's standards. I must consider what horror movies were like at the time and imagine the impact that the film had on audiences. When taking that sort of mindset into account, it's easy to see why the film has been heralded for years. Yes, it looks a lot like other gothic movies from the time, but Black Sunday does some things to separate itself from the pack. For one thing, it's never dull. Again, movies from this period have a tendency to be overly talky and there will be long stretches where nothing happens. That is not the case with Black Sunday, as every few minutes we are treated to another death or some ghastly image. Again, keeping the period in mind, the movie doesn't pull any punches. From the opening scene where the mask is hammered onto Asa's face, we realize that this movie is going to be relatively graphic for the time. From the holes in Asa's face, to her regeneration, to a brief flash during the finale of Asa's grotesque torso, it's clear that Bava wanted to make a statement with the movie. Bava would come to be known for his visual style, and we get a hint of that here. When taken as a whole, much of the movie looks like any other gothic horror film from the time. But, Bava does work in some interesting shots. There is a nice amount of moving camera and some unique angles are worked in from time to time. Even some of the simple dialogue scenes feature camera movements which are meant to keep the viewer interested. The best shot comes when Asa escapes from her tomb. I must say that I was surprised by this moment, as this felt like something which wouldn't have been concocted until the late 1970s at the earliest, lending credence to the claims that Bava was ahead of his time. Given all of that, Black Sunday is still a movie from 1960 and those warts show through. This is a good time to bring up the fact that the version of the film included on this particular Blu-ray Disc is the U.S. release version, which includes dubbed dialogue and a new score. This version runs 4 minutes shorter than the Italian version. Again, this is the only version of the film that I've seen, but here we get very wooden dialogue which is delivered in a very matter of fact manner. This is accompanied by melodramatic music which plays nearly non-stop throughout the film. As noted above, it's these kinds of elements which usually drive me away from older movies, and they really threaten Black Sunday's credibility here. Fortunately, if you can look past these archaic features, the movie comes across as a great example of what gothic horror can be. I recently reviewed the Italian film The Long Hair of Death, which was made four years after Black Sunday. Not only does it also feature Barbara Steele playing dual roles, but it also delivers basically the same plot. The difference is that nothing happens for much of the film. Black Sunday proves to be the exhibition to the rule, as it shows that old movies can have action and pack a punch. Black Sunday features what may be the slowest zombie exhumation ever on Blu-ray Disc courtesy of Kino Classics. The film has been letterboxed at 1.85:1 and the Disc contains an AVC 1080p HD transfer which runs at an average of 30 Mbps. The transfer is a mixed bag. The black and white photography looks very sharp and clear at times, although a fine sheen of grain is often noticeable. While I'm sure that Kino used the best elements which they could find, we do get defects from the source materials here, such as scratches, black dots, and bad splices. The image gets too dark at times, and there were at least two moments where I couldn't tell what I was supposed to be looking at. The picture does show a nice amount of detail, as we can see the makeup on the actor's faces. The Disc carries a DTS-HD Master Audio 2.0-channel track which runs at 48 kHz and an average of 1.6 Mpbs. The track provides clear dialogue and sound effects. The annoying music sometimes overpowers the dialogue, but otherwise the track is well-balanced. The track does have some hissing and popping, and the hissing lessens when the actor's speak. The lone extra on the Black Sunday Blu-ray Disc is a TRAILER for the film. We also get bonus trailers for five other Mario Bava films: A Bay of Blood, Baron Blood, Hatchet for the Honeymoon, Lisa and the Devil, and The Whip and the Body.